"I'm not sure what kind of curse we have on us, but I'm hoping it's not gonna continue once we're in America." Most British bands spend years of their lives and vast quantities of label cash to gain a foothold in America. 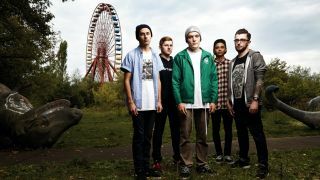 Wrexham pop-punks Neck Deep have managed it almost without trying. "We leave for America for our first proper tour in a couple of days, and some of the shows have already sold out," enthuses guitarist Lloyd Roberts, when we spoke on the eve of their first official Stateside jaunt. "It's crazy really - we've never properly been over there!" His surprise is understandable, especially given the band began life as little more than a casual side project for Lloyd and vocalist Ben Barlow. "We were just writing these songs and sticking them online, and then when people liked them, we kind of had to make a band," he explains. "It wasn't going to be anything serious, but all of our minds changed quickly on that one..."
Having gathered a Facebook following - a significant chunk of which was based across the pond - Neck Deep discovered that these were real fans when they visited Florida on a last-minute holiday deal. to be many people here, but who cares?' Suddenly, we had maybe 100, 150 people in this tiny little room. We were all looking at each other like, 'Right, this is actually becoming a reality.'" Now signed to Hopeless Records, they're the latest in a long line of British bands to have absorbed American influences from a pan-Atlantic position - something rather neatly represented by their gear choices: British tone, courtesy of Orange Rockerverb amps, married with US(-ish) guitars in the form of a Fender Jim Root Strat for Lloyd, and a Frankenstein'd Jaguar for co-guitarist Matt West. With thoughts all on the tour, Lloyd says gear hiccups are rare; it's just the vans that bother them. "Whatever vehicle we're travelling in, will break," explains the guitarist. "It's 100 per cent. I'm not sure what kind of curse we have on us, but I'm hoping it's not gonna continue once we're in America. Especially when you've got a nice 36-hour drive to do!" For more information visit the official Neck Deep website, or connect with the band on Twitter and Facebook.